Here we are, week two of the Zen Art Challenge and I am very pleased with the way the first week went. This week seemed to push me a little future out of my comfort zone and forcing me to create pieces that I otherwise wouldn’t have attempted. This is great for me because I need that push sometimes. 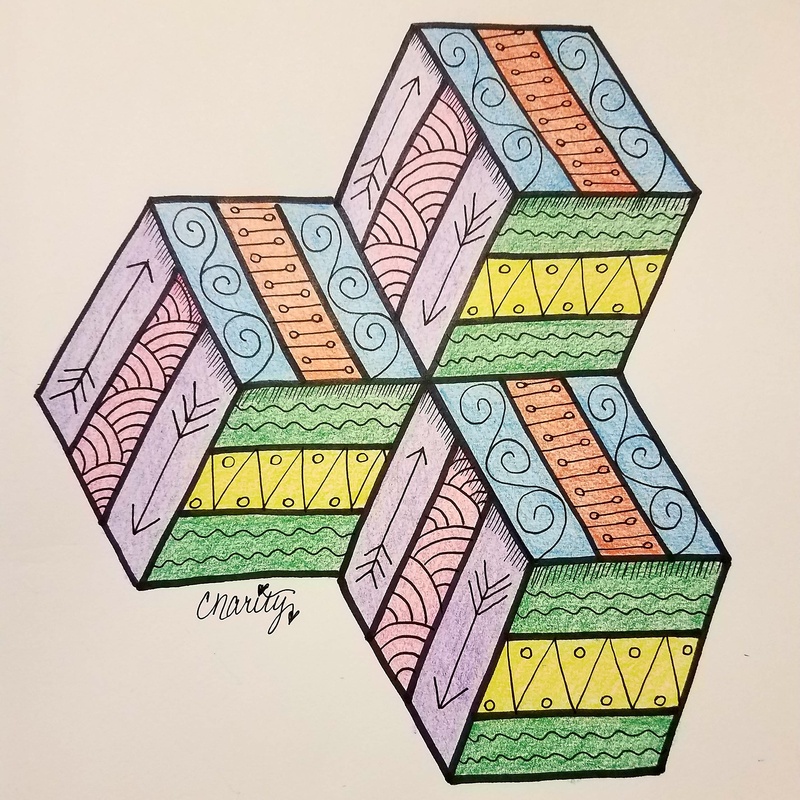 Now I don’t participate in a lot of challenges, frankly because I’m crazy busy, but I love the relaxed challenges like this one that has allowed me to express myself daily and educate myself on new patterns. Learning something new every day is a goal that I’ve had for quite some time. Whether it is a weird factoid, a crazy pattern, or some hidden gem about a family member; learning something every day has helped me stay focused on always bettering myself as a person. You should try it! One day I will have the time to keep track of all these nuggets I learn, but for now, I make mental notes on these. Okay! Without further hesitation, I present to you week two of the Zen Art Challenge for the month of July! The wonderful thing about this pattern is its simplicity. I have never been drawn to a flower such as this, but it would make a beautiful art piece just in of itself. I toyed around with different ways to integrate this pattern, and truly the best way is to group it. Although you can face this either direction I thought they were beautiful all facing one way. I also added some fescue at the bottom just to fill in some lines and then a swirl frame just to add an interesting element. This pattern was… how do you say? Complicated? Let me explain. 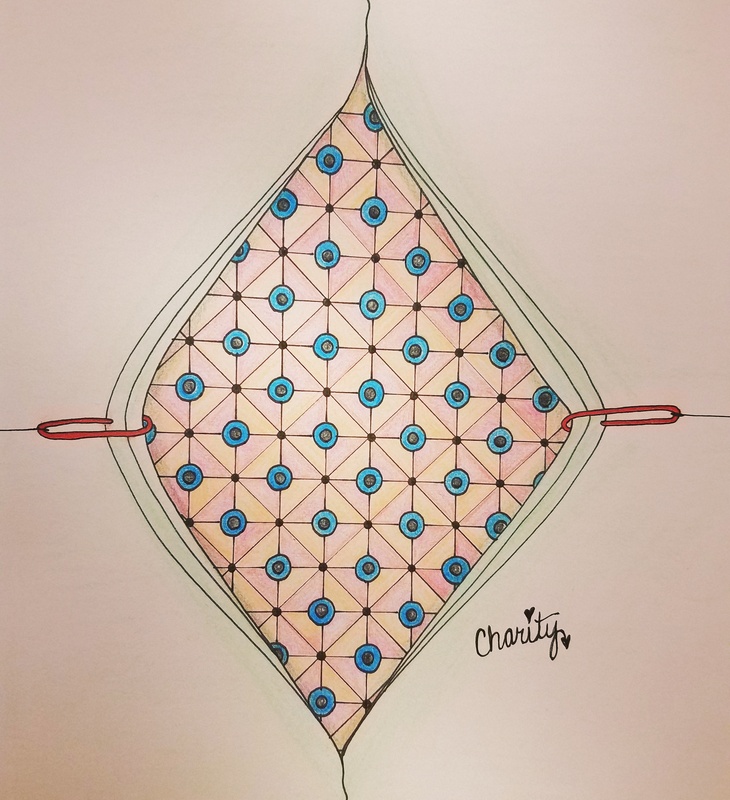 The pattern itself is great as a string, It flows wonderfully. I thought of using it as a string separating some other designs, but in the end, I felt like they looked better as a single unit. They looked like flies, and what eats flies? Well, I’m sure a lot of things, but I decided on the Frog. Now, something you should understand is, I do not draw people or animals. I can not ever get the proportions correct and it ends up frustrating me to no end. 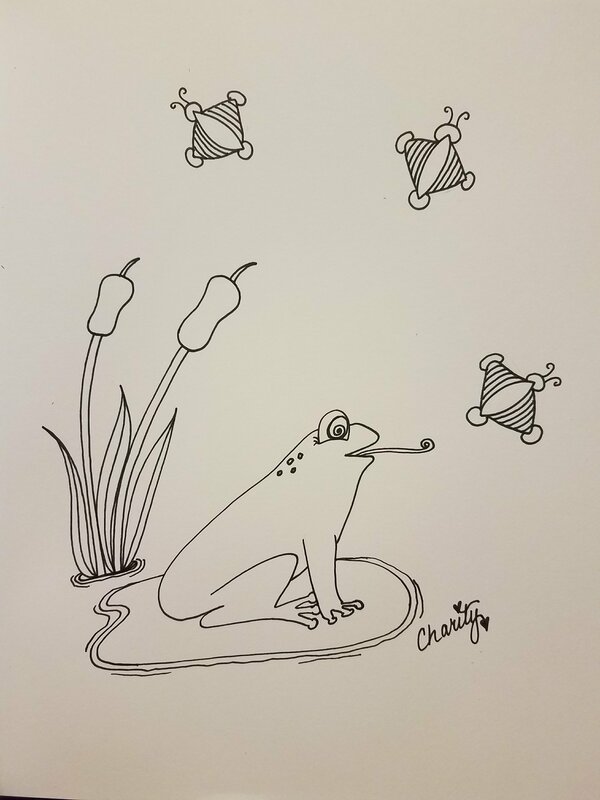 But, I thought I would try a little Frog. The environment I put the pattern in looked better than the frog itself, but it was the best I could do today. Maybe later in life, I will focus more on animals, but for now, I’d like to just enjoy abstract patterns and mandala. What can I say about this pattern? 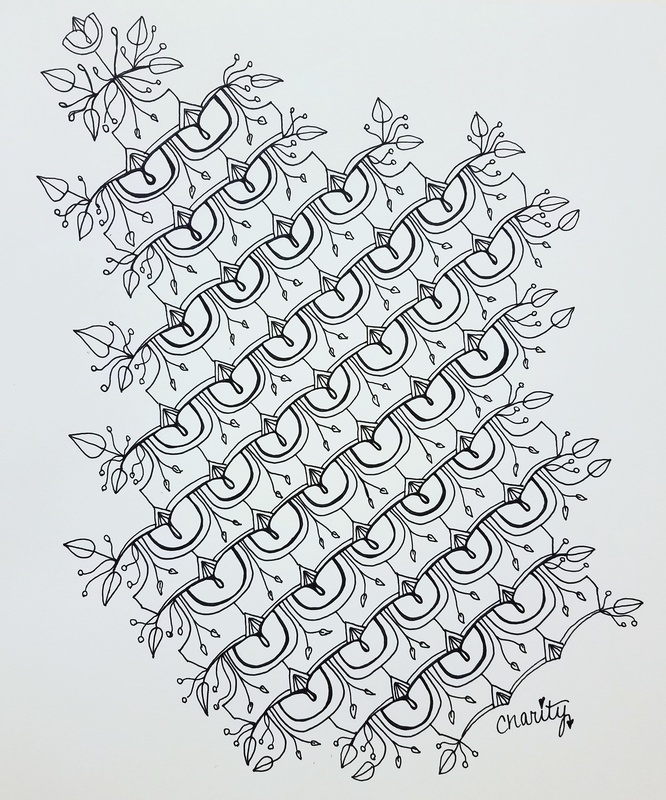 At first, I was very skeptical that I could even do the pattern, but I at least knew I didn’t want to draw a whole page of this tangle. 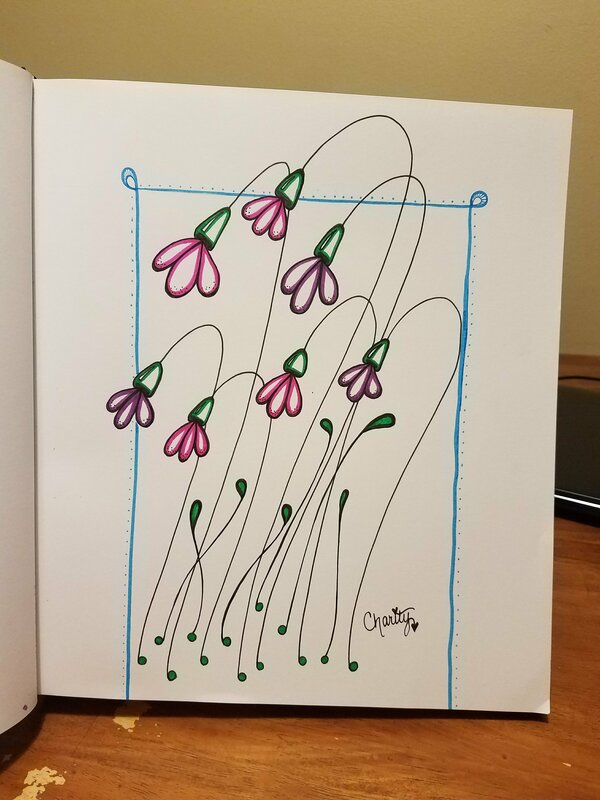 I have been trying my best not to join the tangles together through this challenge and instead challenge myself to complete only mono tangles per day. This is where I was torn with what exactly to do with this one. Wait, torn? YES! That’s it! And that is how this one was born! This tangle was very very boring to me. I decided to spruce it up with a lot more tangles and designs without using any of the tangles from the other days of the challenge. Overall, It seems like the ones that I am the most unsure about are the ones that I get the most responses on. Most of my followers loved the colors that I chose on this. Since I am still learning colors, I just tried to make it look pretty. Okay, I went way overboard on this tangle but just look at the results. I couldn’t believe that so much has been added to the original tangle. I felt like this looked like lace or a Christmas tree. Either way, because the tangle name was Tulips, I knew that I needed to make sure it looked like a garden! I love the way this one turned out and it looks way more difficult than it was to draw. If you want to add some things to a tangle to make it look more intense, just remember that whatever you change, change it the same way each time. When I first saw this tangle, I was a little hesitant. I wasn’t sure how I could turn this tangle into something that I could actually be proud of. In my opinion, this tangle was complete. There was no way to build on it until I figured out a way to introduce it in the shape of a mandala. When I was done with this, I was proud of this dainty work of art. There is no way I could NOT like this tangle. I use it so often in one form or another. 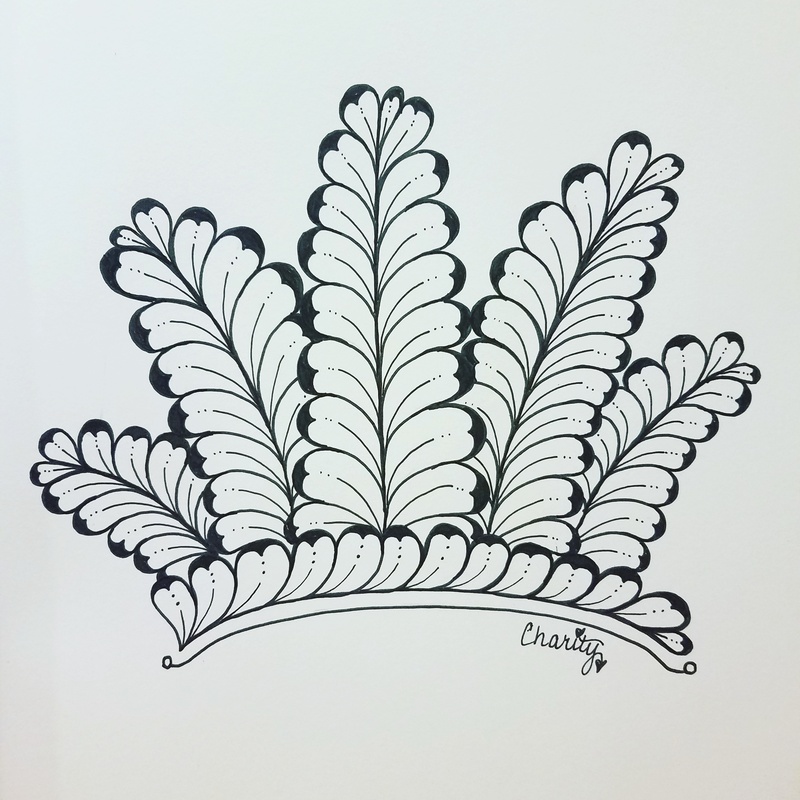 I couldn’t help but turn this into a beautiful crown fit for a beautiful island princess. Of course, it didn’t start out that way. I wouldn’t lie to you like that. All I know is that I love grouping tangles like this together. By the time it was over, it looked like this. Sometimes I don’t plan out the piece and it turns out sorta Meh, however, this one made me brush the eraser shavings off my shoulder in an “I meant to do that the whole time” sorta way. So, here we are at the end of week 2 and I am just loving this challenge a little more every day. What was your favorite tangle mentioned in this post? Let me know in the comments below! 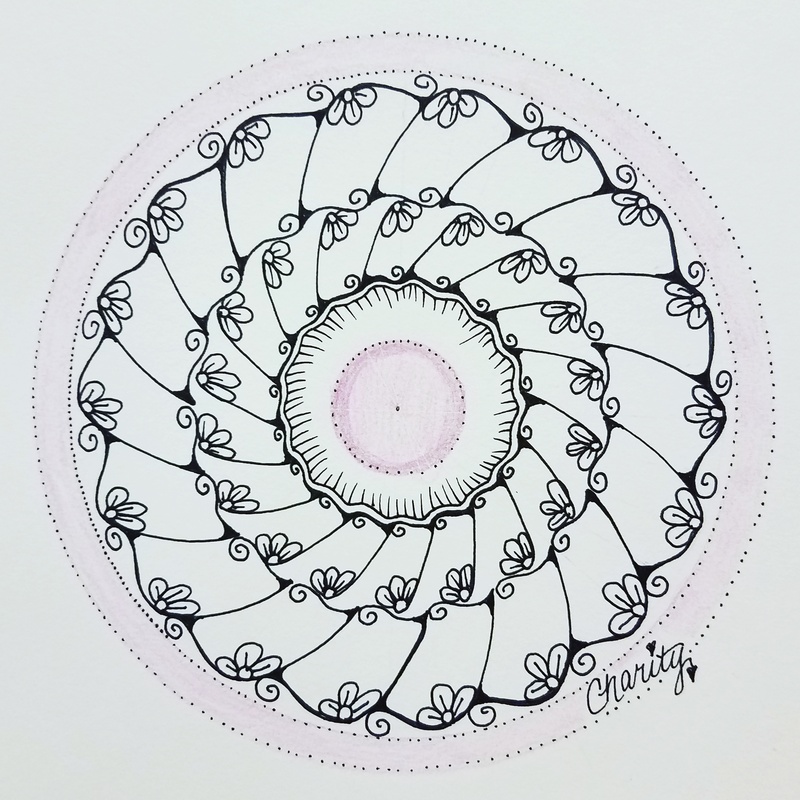 ← What did my first mandala look like? Your drawings of Triaxal and Liefie remain my all time favorites from your drawings. You made seemingly plain tangles look so exquisite! Thank you. I wanted to do something with a lot more details!